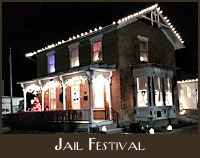 he Old Cedar County Jail in Tipton, Iowa is on the National Registry of Historic Places. 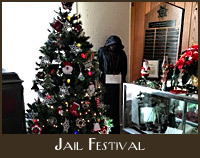 The Old Jail and Residence is the Official Museum for the Iowa State Sheriffs and Deputies Association (ISSDA). 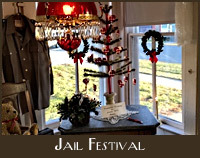 he Old Cedar County Jail is open for viewing the 1st Saturday of each month from 10am to 2pm. Current Calender of Events for the Old Cedar County Jail. 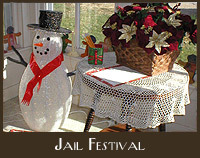 The Residence is decorated in its holiday finery. Mrs. Claus will be here! View Flyer - Click Here! Sponsored by Cedar County Friends Historical Preservation. 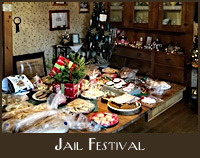 Bake Sale, Holiday items, shirts, jail puzzles and ornaments for sale. Buchanan House Winery wine tasting 5-8 pm. Mrs. Santa will be here! Santa at the Fire Station 5-7 pm. 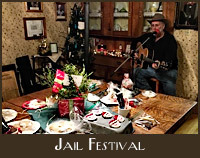 The Cedar County Friends of Historic Preservation was organized in 2001 for the purpose of saving and restoring the Old Cedar County Jail and attached sheriff’s residence. Used continuously from 1892 until 2001, this facility is located one block west of the Courthouse Square in Tipton, Iowa. 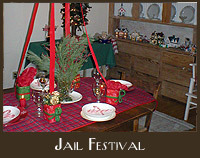 The sheriff’s residence was built in 1855 and the jail in 1892. The facility was placed on the National Register of Historic Places in 2003. Our mission is to promote interest in the cultural heritage of Cedar County. 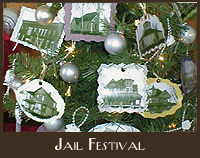 Our goal is to record, collect, preserve, manage and provide access to Cedar County’s Old Jail buildings. 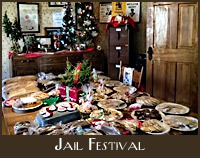 The Old Cedar County Jail/Museum is also the official museum for the Iowa State Sheriff’s Association. Regular meetings are at 6:30 p.m. on the third Wednesday of each month. 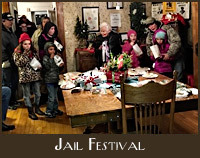 The meetings are held at the Old Jail located at the corner of west Fourth and West Lynn Streets, Tipton, Iowa. Anyone who is interested in aiding in our goals is welcome to join. Any group wanting to tour the facility can contact Kris Clark (563-886-2131) or Daisy Wingert (563-886-2056) or Keith L. Whitlatch (319-329-1785) or email Keith at kwhitl1601@gmail.com. Dues are paid annually and are due January 1 of each year. There are several membership levels from which to choose. Designed and maintained by Belinda Jones at Galloping Winds.